Step aside Halle Berry’s “Catwoman” and Joel Schumacher’s “Batman & Robin”; 2019’s “Hellboy” is the unmitigated embarrassment when it comes to cinematic adaptions of comic books now. When the ancient sorceress Nimue (Milla Jovovich) from the time of King Arthur returns, Hellboy (David Harbour), an agent with the Bureau for Paranormal Research and Defense, must stop her. However, he may also be the key to her evil plans. “Hellboy” peaks in the first five minutes of the movie. This is bad in more ways than one. Obviously, it is bad that the best part of the movie happens right at the beginning because the audience gets all of the goods right away. It is also bad because the first five minutes are unintentionally hilarious. It is so try-hard with attempts to be awesome and artistic that it ends up being enjoyably hilarious. Once this prologue stops, though, the movie goes from funny bad to boring and obnoxious bad. Try-hard is the best way to describe “Hellboy.” The filmmakers so obviously had an intent in mind for how the movie should be– an awesome action flick with a dark tone. Instead, it comes across as a movie that so desperately wants to hold that identity that all of those aforementioned goals become a turnoff. The action in “Hellboy” is awful in every capacity. Some of the action sequences hold no weight because there are no stakes to them and were just tossed in for the sake of having a fight scene. Then, even if there were stakes to the scene, there is no tension because Hellboy has been granted plot armor by the story. There is a fight scene that happens right after Hellboy is severely injured, and he manages to take out three powerful adversaries as if it is nothing. The dark tone and mature themes also do not work. “Hellboy” wants to be dark, but there are moments that are overly comical or trying too hard to be dark that they are just painfully ludicrous for the film to succeed in pulling off the tone. 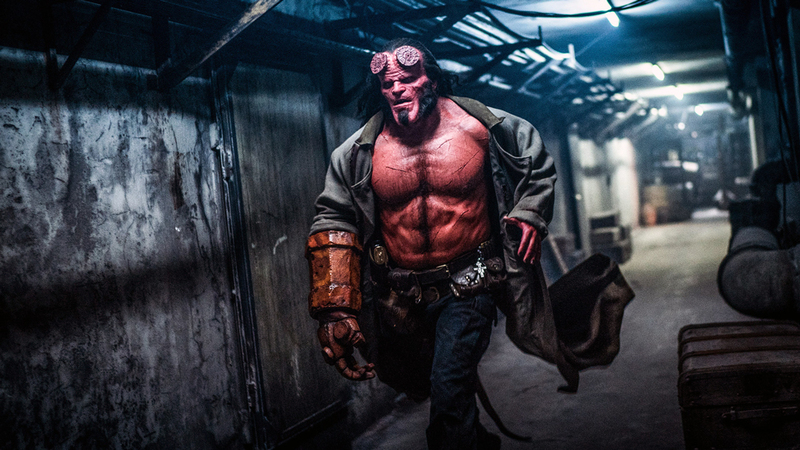 The way Harbour portrays Hellboy also diffuses the dark tone of the film, as he seems less like a character that is battling his inner demons, no pun intended, and more like a whiny, teenage brat who is upset that his parents will not let him stay out past curfew. The juxtaposition of those two ideas just does not work. That is not the extent to how bad Harbour is in “Hellboy,” though. While his portrayal of the character does not fit the film, and he is incredibly annoying to the point where his character becomes unlikable, Harbour is also bad at enunciating his dialogue and emoting. In fact, his acting job gives off the impression that he just does not want to be there. Aside from Jovovich, every major actor in “Hellboy” is bad. Like Harbour, Ian McShane has issues with enunciating his dialogue. Sasha Lane delivers every line in the same tone. Daniel Dae Kim is also bad, though his problems stem from being given nothing to work with and not from him. The lighting is awful. It either does not fit the location of it is done in a way that makes the scene aesthetically ugly. In one scene, London comes under attack and citizens are advised to stay indoors. In a later scene that, in the movie’s time, is within the same hour as this previously aforementioned scene, there are people walking around London and minding their own businesses as if the attack never happened. The best thing that can be said about “Hellboy” is that is has made the people who choose the Golden Raspberry Award’s job a whole lot easier for next year’s ceremony.